After centuries of majestic rule, the mighty empire of the Chandellas is at the verge of extinction; experiencing an unimaginable attack on the night of Amavasya. Only a valiant General who can sacrifice his life to the goddess, to get the ‘boon’ from the deity, can save the kingdom and its glory. Alha and Oudal; the sons of the General who was butchered in an unethical attack, are all set to take revenge and rewrite the history of the subcontinent! The most recited epic after ‘Ramcharitmanasa’ in the North India, ‘Alha’ has survived a millennium, owing to recitals by the masses, through its cryptic poetic structure – just as the famous temples of Khajuraho, which survived under the veils of invisibility, only to be discovered by T.S. Burt in the 1830’s. Engrossing the bravery of the General duo; Alha-Oudal of the Chandella dynasty, it encompasses countless tales of royal kingdoms, betrayals and battle-fields. 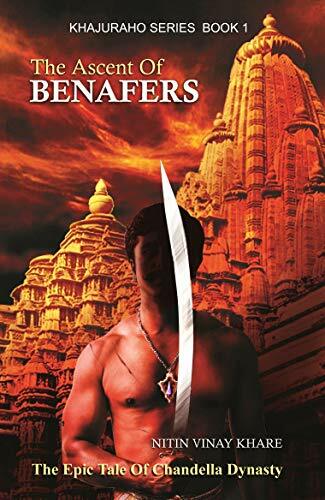 ‘The Ascent of Benafers’ is the first attempt of the ‘Alha’ series to recover and restructure the story, alongside retaining its flavor – that of a timeless, majestic, mythological masterpiece of India. The book is based on mythology and historical story plot which has been beautifully described in detail giving you the historical feeling and evermore taking you back to the time period. Taking you along the journey. The story is about alha and oudal. You will enjoy the book as some movie. The book has been written in simple vocabulary and even the meanings you do not know are given in the end. The book consists of different chapters like mayhem and the war. It is a long read and pay heed to the characters as there are many and it takes time for the book to catch pace. The cover could have been better but depicts about revenge and war. The title seems to go along as well. The description of the events are really fantastic. The book is first in this series. Can’t wait to know what more is there in the future books.